Adult: $162 available through January 31 (Early Bird). Beginning February 1, $180. Child (ages birth-14): $30 Should be included on their parent/guardians’ online registration. Walk-in: $180. Walk-in Registration for adult only, no guarantee of meals. Minors cannot be accommodated without advance registration. Fees include: All programming Friday night through Sunday noon; Saturday breakfast, lunch and dinner; Sunday breakfast. Refund Policy: All cancellations will be subject to a $15.00 processing fee. Cancellations after April 15th or an event no-show may forfeit entire registration fee, except in cases of emergencies or hardship. 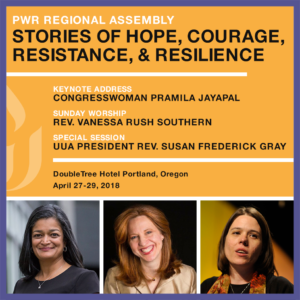 Please send notice of cancellation and refund requests to pwrregistrar@uua.org. Religious Professional Development Day for Ministers, DREs, Music Directors will be held Friday April 27 at First Unitarian Church of Portland. Fee: $100 (Childcare: $30/child). This registration form covers both events. Information about accommodations, including information about staying in hotels with youth, can be found on the PWR website. April 27, 2:00 pm – 7:00 pm and April 28, 7:00 am – 9:00 am.